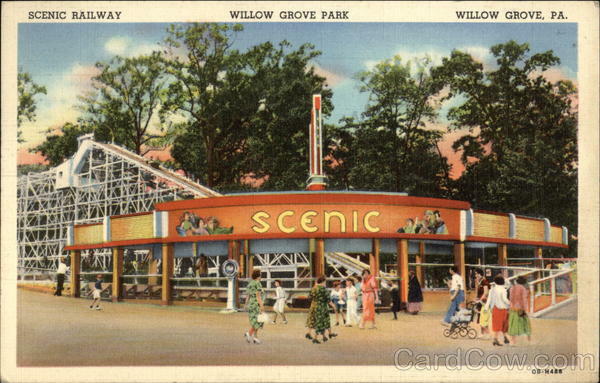 When thoughts of Philadelphians turn to the amusement parks of yore, Willow Grove Park often takes center stage. I only encountered Willow Grove Park from afar—gazing out on its closed gates while my mom browsed the aisles of the Kmart adjacent to it during the 1970s. Though the park in its “Six Gun Territory” incarnation was clearly a shadow of its former self, my mom assured me that it had been quite the destination in its day before Disneyland and the modern amusement park. What’s the story of this former jewel? 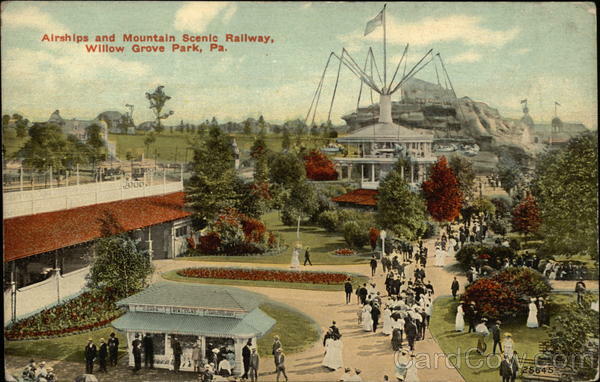 An early view of the Willow Grove Park. Image courtesy of Card Cow. 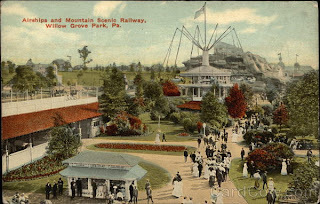 Way back in 1896, the owners of the Philadelphia Rapid Transit created Willow Grove Park to serve as a reason for its regular riders and their families to hop on the trolley on weekends. Ideally placed on 130 acres at the end of trolley lines from Philadelphia and Doylestown, Willow Grove Park also drew visitors who disembarked at the recently opened Willow Grove station of the Pennsylvania & Reading Railroad. 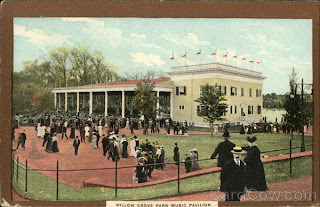 Willow Grove Park started out simply as a picnic grove where families could escape the urban heat, but “Philadelphia’s Fairyland” grew to include a huge manmade lake and a pavilion for free concerts. It also became the “Music Capital of the World” by hosting popular band leaders such as Arthur Pryor, Victor Herbert, Patrick Conway and John Philip Sousa. Mega-concerts would draw as many as 50,000 people a day. The Park's famed music pavilion. Image courtesy of Card Cow. By 1909, attendance for the season topped 3 million people. During its heyday, the park employed hundreds of locals, including young James Michener who worked as a ticket-taker to help pay his way through Swarthmore College. 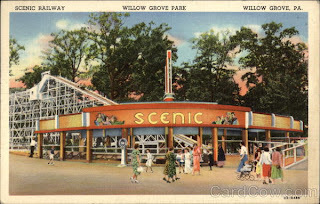 Over the years, Willow Grove Park added a multitude of unique rides. The towering Alps railroad ride beckoned to patrons who could spot its mountain from miles away. Park-goers could travel to Venice without leaving Pennsylvania, floating on a gondola ride through a series of canals. The miniature airships of the Captive Flying Machine lifted thrill-seekers 600 feet off the ground. And long before Disney’s clever multimedia/multisensory attractions, Willow Grove Park visitors could experience Tour of the World, with its railroad cars that rocked back and forth while a movie projected scenery on a screen. A view of the Park circa 1942. Image courtesy of Card Cow. Of course there were rollercoasters too—in the early years the Coal Mine and later the Thunderbolt. Willow Grove Park also had stupendous carousels, other classics like the Whip, and a midway full of carnival games. Nights ended with a spectacular colored fountain show on the park’s immense lake. For a time, life really was a lark at Willow Grove Park. After World War II, Willow Grove turned into a promised land for real estate developers, and between 1950 and 1960, Willow Grove’s population doubled to 20,000. The opening of its own turnpike interchange in 1954 solidified the town’s status as a suburban gateway. The land of the automobile demanded highways, and the Route 309 Expressway soon spelled the end of trolley service to the park when it cut off the trolley tracks. Beckoning patrons during the era of the automobile. Image courtesy of Card Cow. Though many potential patrons now lived in the Park’s backyard, attendance declined rather than flourished since those pesky personal automobiles tended to lured people to more exotic destinations further from home for their thrills. At the same time, the forces of retail began to nibble away at the park’s margins. A 13-acre portion of the grounds was sold off, and in 1947, a Penn Fruit Supermarket opened there. By 1953, Snellenberg’s Department Store and G.C. Murphy’s Store had also taken up residence nearby. The park tried to adapt its entertainment to changing tastes. Groups like Bill Haley and His Comets graced the stage. In 1958, the Hankin Brothers purchased the Willow Grove Park and attempted rejuvenation by constructing new attractions like the largest bowling alley in the world with its 116 lanes. Willow Grove Park in later years. Image courtesy of Card Cow. Despite valiant attempts, Willow Grove Park wasn’t able to outsmart the forces that led to its extinction. By the early ‘70s, the park’s new owner rebranded it as Six Gun Territory, but the western theme did little to spark interest. In 1976, the park closed for good. Within a few years, residents were again recreating at Willow Grove Park—enjoying the ultimate leisure time activity of the 1980s—mall shopping. Want to take a longer ride on the Willow Grove Park time machine? Watch this 1956 promotional film for the park on You Tube. Want to read more about the history of the Park? Check out the book Willow Grove Park from Arcadia Publishing. 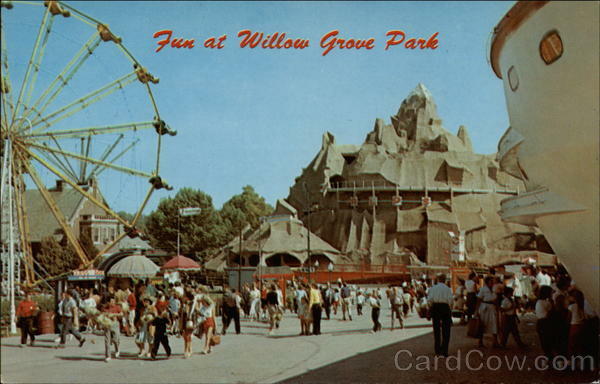 Want to reminisce about Willow Grove Park? Tell us your memories of this legendary amusement park in our comments. Oh, wow, YES. The Thunderbolt -- there was absolutely nothing more exciting than to ride the Thunderbolt in the late 1940s. I grinned with superior satisfaction when the littler kids in the family had to be content with the Little Scenic. Hee Hee. 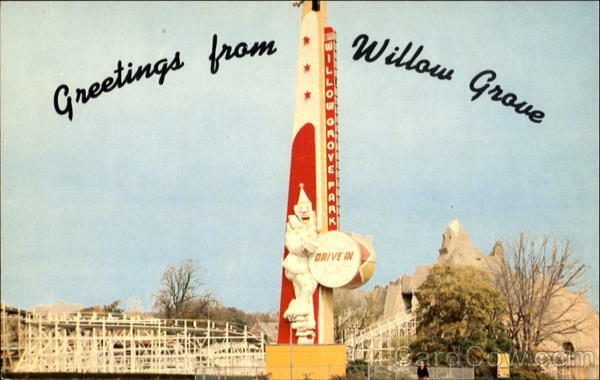 Willow Grove Park was where I had my first cotton candy, my first ride on a Ferris Wheel, my first ride on a Merry-Go-Round. I can still see my aunt sitting in one of the non-moving chaises on that carousel, and couldn't understand, for the life of me, why she didn't want to ride one of the horses that went up and down. Another Philadelphia memory -- the billboard that had the bicyclist on an old-fashioned bike with the huge front wheel -- and the wheels actually went around and around. I think that was on Roosevelt Boulevard not far from Broad Street. Marty, no longer a Philadelphian -- but I remember! Despite being born and then growing up within a couple of miles of Willow Grove Park, I was never lucky enough to experience it while it was open. My parents & neighbors all talked about how dangerous the crowd had become, with fights and other violent behaviors seemingly becoming the norm. I was six years old when it was shuttered for the final time in 1976. My memories are of an abandoned amusement park next to Willow Grove Lanes with its outrageously long, pointed portico with a neon star at the tip. Watching the park being demolished for a shopping mall was exciting for me. I too would have liked to have known the Park when it was at its best--one of the reasons I enjoyed researching to learn more about what it was like in the good old days. Thanks for sharing! Our grammar school (St. Bonaventure) had the school year end picnic at this park. I remember going with my mom and brother and a friend and her family up on the trolley from North Philly. It was a long ride but I always enjoyed trolley rides. I remember going on every ride at the park except the Alps. The Haunted House was neat. But the picnic grounds were so nice and the Swan Boat. Certainly was a lot of fun back then. Thank you. What happened to the swan boat from Willow Grove park? It wound up being in the back area of the Hankin Estate on Easton Road (the estate is still across from the former main entrance to the Willow Grove Naval Air Station). I remember seeing it there driving past it over the years. The boat unfortunately must have rotted away as haven't noticed it there. Phila PA Chronicles is a walk down memory lane to revisit the people, landmarks and happenings in the Delaware Valley during the 20th century. Its name was inspired by the pieces of hand-addressed mail that Philadelphia residents would receive from senders who didn’t want to be bothered with writing out the city’s lengthy name. Phila PA Chronicles covers the region, not just the city. All four of Philadelphia’s suburban counties and South Jersey are fair game. Phila PA Chronicles was created by Joanne McHugh, owner of Personal Chronicles, a company dedicated to helping ordinary people save their life stories. Personal Chronicles is a company that works with ordinary people who want to save their personal histories. Gather your photos and memorabilia and share your recollections, and Personal Chronicles will create a custom-made book that weaves together memories, images and history.